Because of diseases and invasive species, the Commission recommends as a good conservation practice that anglers not transport any live fish out of the Lake Erie Watershed and introduce those fish into other watersheds. For more information, visit our pages about: Aquatic Invasive Species or Viral Hemorrhagic Septicemia (VHS), or contact the Commission’s Northwest Regional Office. The following seasons, sizes and daily limits apply to Lake Erie, Presque Isle Bay and peninsular waters, all Lake Erie tributaries in their entirety which include Cascade Creek, Conneaut Creek, Crazy Run, Crooked Creek, East Branch Conneaut Creek, Eightmile Creek, Elk Creek, Fourmile Creek, Middle Branch Conneaut Creek, Marsh Run, Mill Creek, Mud Run, Raccoon Creek, Sevenmile Creek, Sixmile Creek, Sixteenmile Creek, Stone Run, Temple Run, Turkey Creek, Twelvemile Creek, Twentymile Creek, Walnut Creek, West Branch Conneaut Creek and all waters that flow into these tributaries. ** It is unlawful to fish or possess trout or salmon in or along any Lake Erie tributary stream from 12:01 a.m. on April 15 until 8 a.m. on April 16 (32 hours total). From September 6 until the opening day of trout season in April, all Lake Erie tributary streams are closed to fishing from 10 p.m. until 5 a.m. on the following day except for Walnut Creek north of Manchester Bridge Road and Elk Creek north of Route 5. 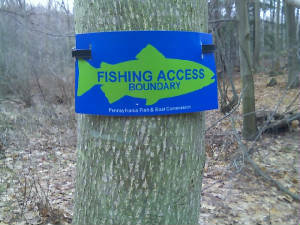 Anglers fishing inland ponds, lakes, and reservoirs in Erie County are not required to possess a Lake Erie Permit. Because of diseases and invasive species, the Commission recommends as a good conservation practice that anglers not transport any live fish out of the Lake Erie Watershed and introduce those fish into other watersheds. For more information on invasive species, please see “Stop Aquatic Nuisance Species.” For more information on VHS, please contact the Commission’s Northwest Regional Office or visit our VHS information page.